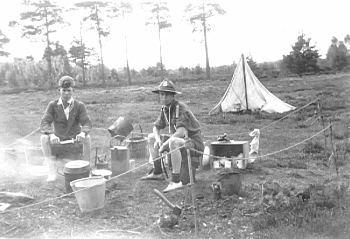 Normandy Scouts (one of whom is believed to be a "Dyson", according to Mrs Joan Brooks), seen camping about 1932, possibly on Pirbright Common. This building, still in use but not for scout meetings and activities, was a Canadian Army hut brought over from Witley Camp in 1919 and erected on land purchased from Longerend Farm. William Henry was appointed Scoutmaster and D B Pitt Assistant Scoutmaster. Mrs Henry was appointed Leader of the first Wolf Pack in 1922 with 15 cubs in her charge. William, her husband, retired in 1928 when there were two scouters, 20 scouts and 12 cubs and she took over the Warrant and duties of Group Scoutmaster holding the Warrant until 1959. In addition to her group duties she found time also to help with the organisation of the World Jamboree at Arrowe Park, Birkenhead. She dedicated 38 years to the scout movement, enabling many of the youth of this village to prove themselves and to prepare for adulthood. In 1954 the 1st Normandy Scout Group won the Harvey Totem Pole for camping, the Packman Flag for scout craft and the Gordon Whale Cup for drill, the first time that the three trophies had been held by a single Group. The golden anniversary celebrations focused attention on the inadequacy of the headquarters building and the need for replacement for which a "new building fund" was subsequently started. Thanks to keen local support, particularly from Doreen Halton, Pam and Jim Chant and Edie Sharp the target of £1000 was reached within 5 years. The Scouts Association rewarded each of them with a "Thanks Badge". The opening of the new headquarters on 12 September 1970 by past District Commissioner Major-General Bond was a nostalgic occasion for a number of guests, especially for the Reverend Andrew Tuck, Queen's Scout and former member of the 1st Normandy Troop, who administered "the Blessing". The Group is fortunate in possessing extensive grounds around their headquarters building, ideal for practising camping skills and outdoor activities enabling them to win the Surrey Camping Competition on at least three occasions. Undoubtedly many present and former residents will remember the swimming pool. 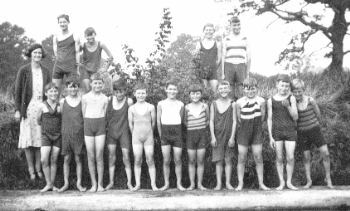 Although perhaps comparison with a Guildford Spectrum type of pool is hardly fair, it has been greatly appreciated by both the scouting fraternity and the populace of Normandy until its decline in about 1980. In 1996 it was drained, filled and the site landscaped. Miss Florence Kate Manfield, a teacher at St Mark's, Wyke C of E School, in charge of the group at the Swimming Pool, 15th September 1930, she left the school two years later with her marriage on 26th September 1932. Standing at the back L- R: Frank Weston, Fred Oliver, Dennis Woods, Bill Crighton. Front row L- R: Frank Chant, unknown , Syd Humby, ? Slaughter, unknown, unknown, Charlie Oliver, unknown, unknown, unknown, Gerry Avenall. In 1974 an International Scout Camp was held at nearby Fairlands Farm bringing together 1200 scouts and guides including those from Normandy. Camping is a feature of scouting life. "Going to camp in Jim Chant's lorry" is remembered by many ex scouts and not just those of Normandy but of other Groups in the district for it was Jim's pleasure to help set-up camp and return at the end of the holiday to help strike camp. Residents will recall Bob-a-Job week when a smartly uniformed scout or cub would turn up on the doorstep asking for work. It was an innovative and imaginative scheme to raise funds. The "no nonsense" attitude as to the size or the unpleasantness of the job, had great appeal but sadly the scheme was abused and eventually laid to rest. The 1st Normandy scouts is one of the few Groups that display a Roll of Honour for its King's Scouts and Queen's Scouts. David Kimber, Robert Watson and Bernard Crooke were the very first Queen Scouts in the group. The Normandy scouts group were very successful during that period at winning all of the local scouting competitions beating all the Guildford groups much to their annoyance. It also holds an unusual record in that father and son both gained the Queen's Scout award. Bill Knight gained his in 1959 and his son Richard in 1989. In 1970 Bill Knight retired as Assistant Scoutmaster and became Venture Scout Leader. By 1989 he had, to his credit, produced 22 Queen's Scouts. There has been a wonderful history of husband and wife teams serving the Group. Starting in 1912 with the Pickfords followed in the early 1950s by the Henrys and then by the Boxalls. Don and Pat Plumley worked together for 25 years followed by Jonathan and Carole Gasson with Tony and Carol Shirtliff continuing the tradition. Warrant holders have always enjoyed a wonderful support from its lay officers, too numerous to mention here. They, together with family and friends over the years, have helped to make the 1st Normandy Scouts Group a successful and vibrant member of the scouting movement. 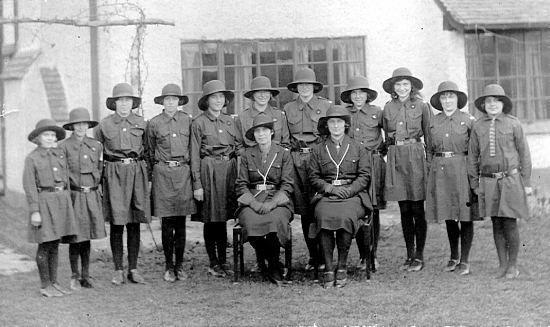 1st Normandy Girl Guides formed in January 1931.
the home of Mr. and Mrs. Leslie Grimshaw. 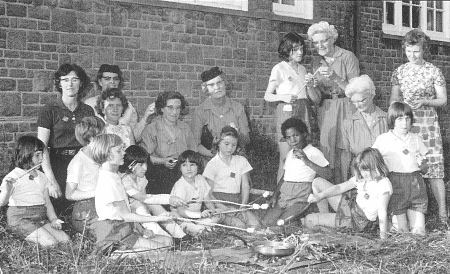 The 1st Normandy Girl Guides was formed in January 1931 with Beatrice Grimshaw as Captain and Doris Spears as her Lieutenant. Initially their meetings were held each Saturday evening in the village hall. Sir Philip and Lady Henriques frequently invited the guides to their home at Normandy Park where the girls entertained them with singing and dancing. Lady Henriques presented the guides with a Union Flag which, Joan Dyson recalls carrying to St Mark's Church where it hangs to this day for safe keeping. The original "Colours" that were carried and featured on formal occasions were mislaid but in 1973 new ones were presented anonymously and blessed by the Reverend Graham Hawkett at a special service. Ethel Turner recalls that when she was Guide Captain between 1945 and 1952, the guides and ranger guides met in either the church hall or the village hall. Apart from the regular weekly activities, they attended rallies in Guildford, and on one special occasion met Lord Baden-Powell at Hampton Court. In 1945 the Summer Camp was held on the Isle of Wight. At the meeting of Normandy Girl Guides in the church hall on Friday the 25th January 1952, the District Commissioner, Mrs Wadeson, presented The Badge of Fortitude to Miss Pat Bowers of Harpers Road, Ash. Miss Bowers had been suffering from acute paralysis for several years, and had been in a plaster cast. The badge is awarded to guides who, under exceptional circumstances, carry out the 8th Guide law - 'A Guide smiles and sings under all difficulties'. Guests of the evening were Mrs Bevis of the local Girl Guides Association, and Miss Tapply, (Brown Owl). 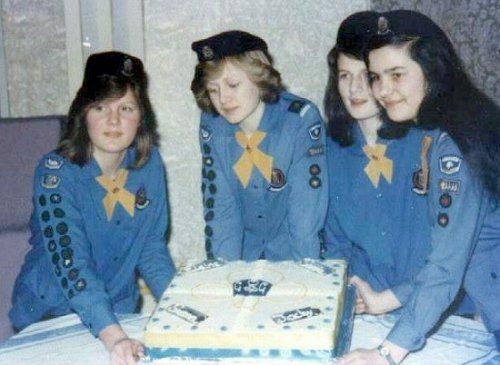 The guide uniform, like that of the scouts, has changed over the years to reflect the fashion of the period and to suit today's more active pursuits of guiding and like the scouts, obtaining achievement badges is equally important to the guides In September 1984, for nine months, Puttenham Guides with their leader Sheila Smethurst, amalgamated with the Normandy Company. Another Guider who comes to mind must be Pat Vant Riet, who not only helped with the regular organisation of the Group but played a major part in the training and mentoring of those guides that achieved the Queens Guide Award. Mary Dey (former Brown Owl at Normandy and currently Brown Owl at Wood Street Village), writes to tell us that sadly, due to a lack of girls of guide age, the Guide Unit at Normandy was closed in about July 2000. The Brownie Unit was closed in December 2004; again due to a lack of girls of brownie age in the village. On the 26th May 1984, The Queens Guide Award was presented to Lorna Sherwood and Davina Turner by Mrs Eileen Bunyan (formerly Manuel), District Commissioner of Ash District, who in 1950 was the first Normandy Guide to receive the Queens Guide Award. However, Normandy Brownies merged with the 4th Stoughton Brownies (since they had not had a permanent leader for a few months), and the newly merged unit meets in Wood Street Village and is thriving and is attended by a number of girls from Normandy. A Brownie pack, sometimes called Brownie guides, was formed in 1932 possibly as part of the West Surrey, Woking Division, Brookwood District. The records of the Guildford Rural Division, Ash District, indicate that Ellen Garman was appointed Brown Owl of the Normandy Pack on 24 July 1933, continuing as Mrs Ellen Passingham until November 1937 when Miss J Wilson was appointed as Assistant Brown Owl and then Brown Owl in 1938. Doris Baker who retired in May 1945, took over from her in 1943. Betty Tapply, who became Tawny Owl in 1945 and Brown Owl the following year, became the driving force of the pack and remained in the post until her retirement in 1965. In later years, some former Brownies returned to Betty with their offspring for enrolment. The Brownies are pictured during their first Pack Holiday at Littleton Youth House in August 1968. The Brownies were under the Leadership of their Guider, Doris Page (back row 4th from left) who was assisted by Miss J Cooper, Wood Street Guider, Mrs H Sinden and Mrs F Allin, Park Barn Guider. Brownies Pamela and Sally Kirtley are sitting in front of Doris Page, Debbie Chattaway is kneeling to their right, Jane Baunsey is kneeling to the left of Doris. Brownie Sarah Turner is standing receiving tuition and Jeanette is kneeling in front of her. Brownie Vivien Van 't Riet is kneeling far right with Pat Boumphrey reclining in front of her. Brownies worked for their achievement badges in the same manner as did the scouts, cubs and guides. Thanks to the patience and help of parents they gained skills in cookery, art, writing, gardening, entertaining, swimming and first aid, to name but a few, and all put to good use at camp. They were too young to be allowed to camp under canvas but nevertheless enjoyed their "pack holidays" at various village halls and, of course, Wanborough Youth House at nearby Flexford. Their pack meetings all ended with singing and playing games thus ensuring happy faces at the end of the day. In 1965 the Brownies were thriving and meeting weekly in the church room with Doris Page as Brown Owl assisted by Louise Rigby as Tawny Owl followed by Evelyn Bush. In March 1970, they were proud to welcome Lady Baden-Powell, grand daughter-in-law of Lady Olave Baden-Powell to their "thinking day" at St Mark's church room. Guests were entertained by poetry readings and tea was served by six Brownies each anxious to obtain a hostess badge. The pack had a number of successes singing in competitions, attributed without question to the enthusiasm and choral exuberance of Doris, her helpers and parents. Many families will remember Doris and her little group singing carols outside their homes. 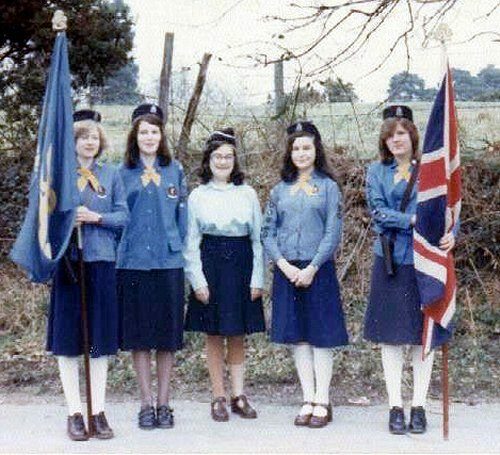 In 1972, they came second in the National Guide Festival of Song, featured on London Radio, and in 1980 entered and won the Song & Dance Festival arranged by the London and South East Girl Guide Association. As with the Girl Guides, Mary Dey (former Brown Owl at Normandy and currently Brown Owl at Wood Street Village), writes to tell us that sadly, due to a lack of girls of guide age, the Guide Unit at Normandy was closed in about July 2000. The Brownie Unit was closed in December 2004; again due to a lack of girls of brownie age in the village. &COPY; Copyright by Normandy Historians All Rights Reserved.